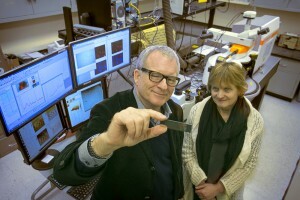 Professor Gordon Taylor and lab technician Tatiana Zaliznyak with Raman microspectrometer, atomic force microscope and control center in background. Welcome to the NAno-RAMAN Molecular Imaging Laboratory (NARMIL). The NAno-RAMAN Molecular Imaging Laboratory (NARMIL) hosted by the School of Marine and Atmospheric Sciences (SoMAS) was established in January 2014 through the NSF Major Research Instrumentation (MRI) program. The facility, located in Endeavour Hall 170, supports research in marine, atmospheric, environmental, biological, chemical, geological, materials sciences, and biomedical engineering, but is open to other applications as well. The lab provides state-of-the-art instrumentation and expertise for analyses of single cells, aerosols, natural and engineered surfaces, minerals, biofilms, thin films, and novel synthetic materials. The lab’s vision is to offer unique analytical solutions to chronic limitations experienced in many research areas, to enable transformative discoveries, and to educate the next generation of scientists. NARMIL is home to a Renishaw inVia Confocal Raman Microspectrometer and a Bruker Innova Atomic Force Microscope. These instruments can be operated independently or coupled for co-localization and Tip-enhanced Raman Scattering (TERS) and offer high performance, reliability, modular design, and user-friendly operating systems. The entire system is mounted on a floating 5’x8′ Newport INTEGRITY 3 vibration isolation table.